We generally prefer to get around by public transport when we travel – it’s much cheaper, there’s less to worry about and it can be a good way to learn how locals live and move around. 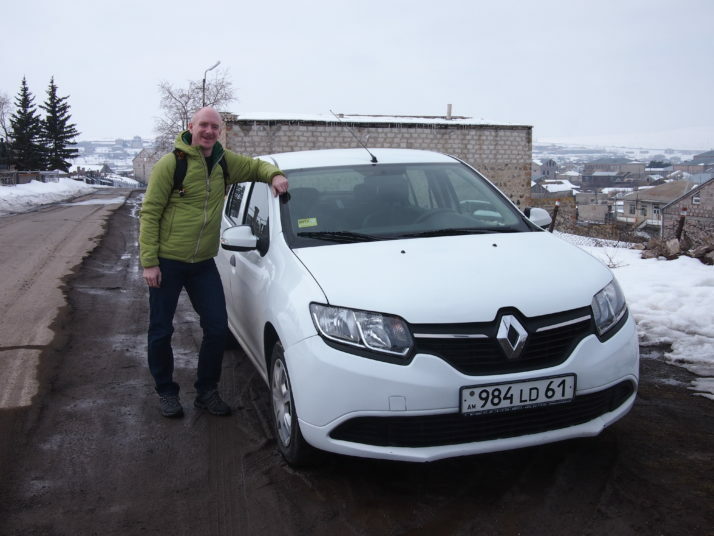 However, when we were researching Armenia there were several sights that we were keen to see but seemed difficult to link together with public transport without using up more days than we had, so we decided to hire a car for just under a week. After collecting the car in the centre of Yerevan we drove north for about an hour to Lake Sevan, one of the largest freshwater high-altitude lakes in the world. About 35km to the south along the lakeside road we arrived at the small village of Noratus and one of my favourite sights in Armenia. 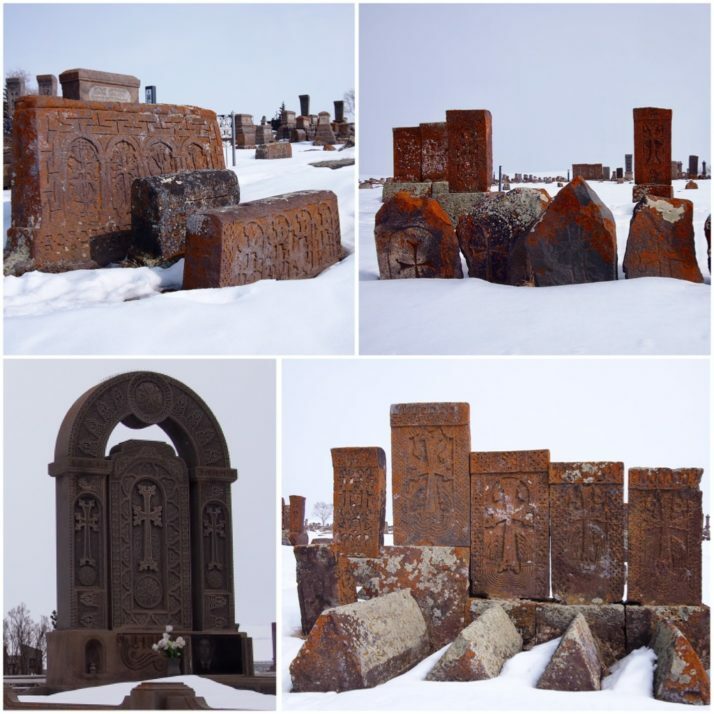 The graveyard here is incredible, it dates back to medieval times and contains over 800 khachkars (literally ‘cross stones’) carved between the 9th and 17th centuries. It looked even more magical as the ground was covered in a thick layer of snow and the sun came out just as we arrived. Walking around we could see how the khachkar developed from the early cradle stones, so called as they mimic the shape of a traditional hanging cradle, into more and more intricately carved crosses. 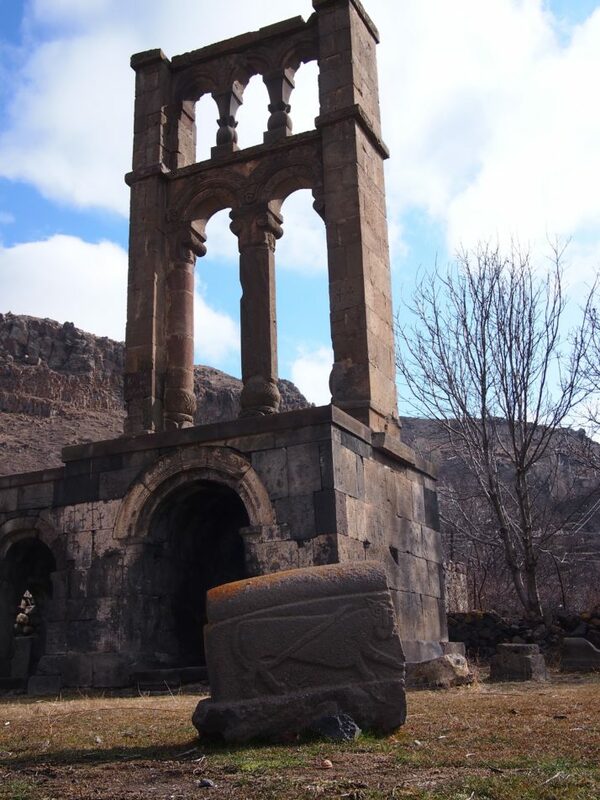 Khachkars are found all over Armenia, particularly around churches and monasteries, and they seem to have a wider cultural rather than just religious significance. The cross often grows from a representation of the Tree of Life and they can be decorated with carvings of the sun and moon, plants or people. 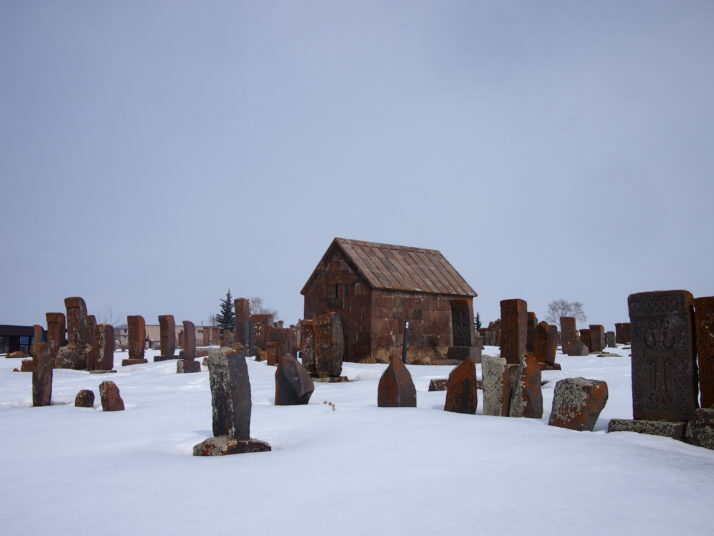 The cemetery is still in use, unfortunately we didn’t have much time to look around the modern section as it was beginning to snow and, despite our best efforts, forging our own path through the snow had resulted in wet socks and cold feet. Nevertheless by the end of that first afternoon we’d already decided that the car hire had been a splendid idea. 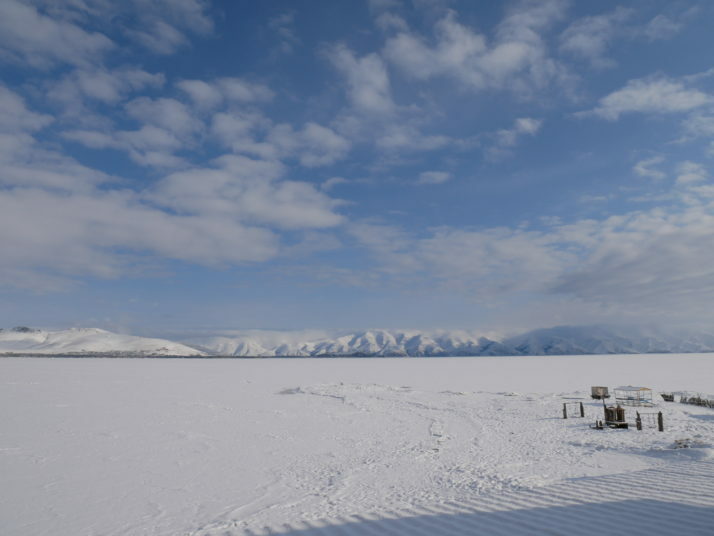 Frozen Lake Sevan from our hotel room. It’s not usual for the lake to freeze, but locals told us that 2016/17 had been a particularly cold winter. 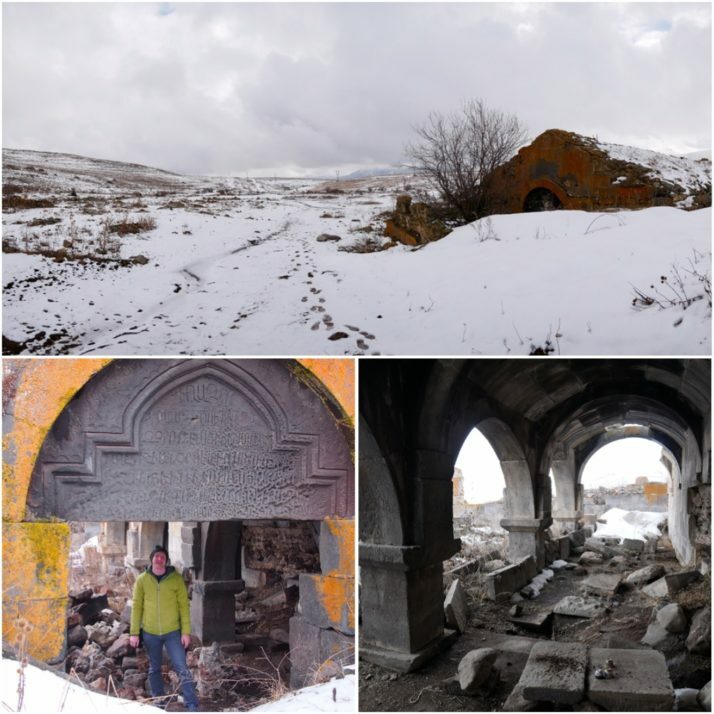 Next morning, we cleared 5cm of snow off the top of the car and set off on the longest drive of the week to Syunik, the southernmost province of Armenia. 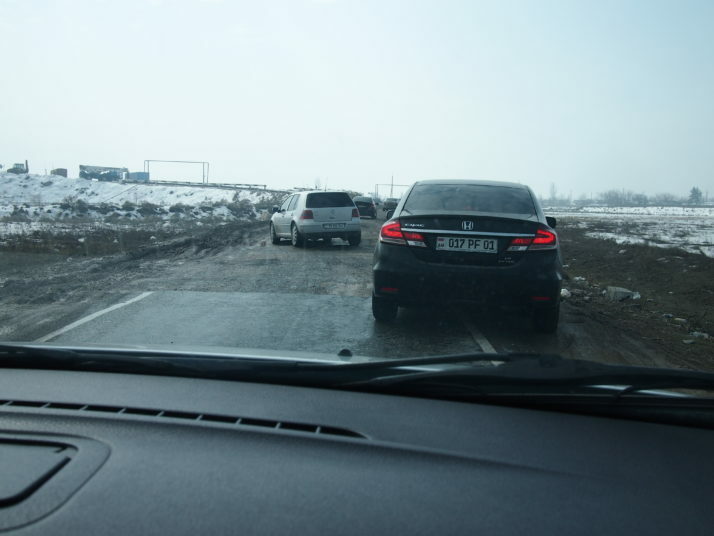 During the summer the journey might be a bit shorter, but in early March the most direct mountain pass is still closed by snow and our only option was to take the road back to Yerevan and continue from there along the main highway to the south. By late afternoon, we arrived at another equally remarkable but even older site. 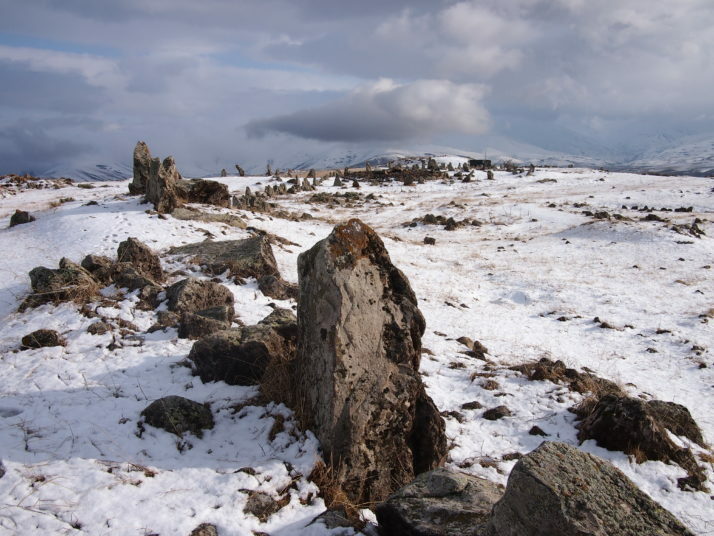 Just outside the town of Sisian, Zorats Karer is also known as the Armenian Stonehenge but is actually even older. 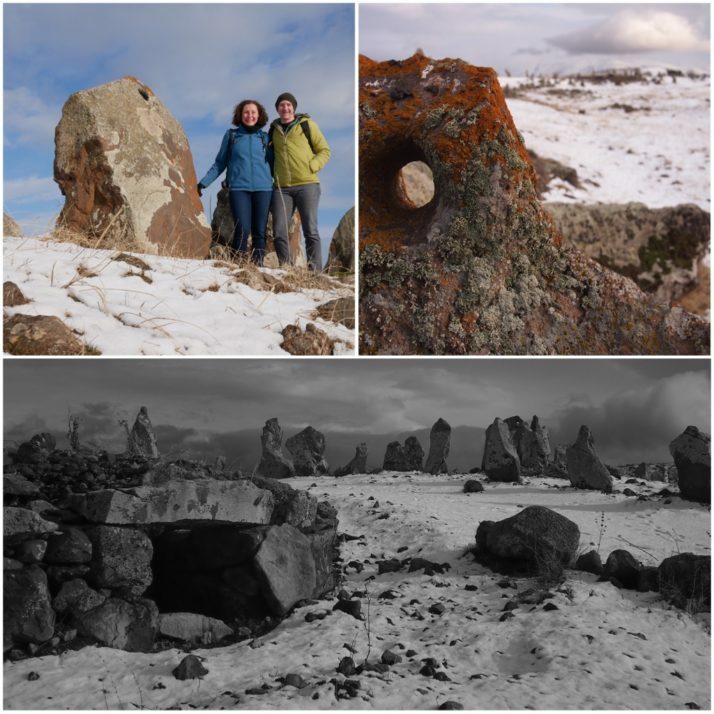 Sited on a plateau surrounded by hills, archaeologists have dated the stones and tombs to 3000BC. Again the weather was kind, the sun came out and we had the place to ourselves though it was bitterly cold on the exposed hilltop. The standing stones are arranged in an oval around a central burial tumulus and sweeping off in two arms to the north and south so that it probably looks a bit like a galaxy from above. Around 80 of the 223 stones contain holes near their top which are believed to be aligned with the stars making it an ancient astronomical observatory. 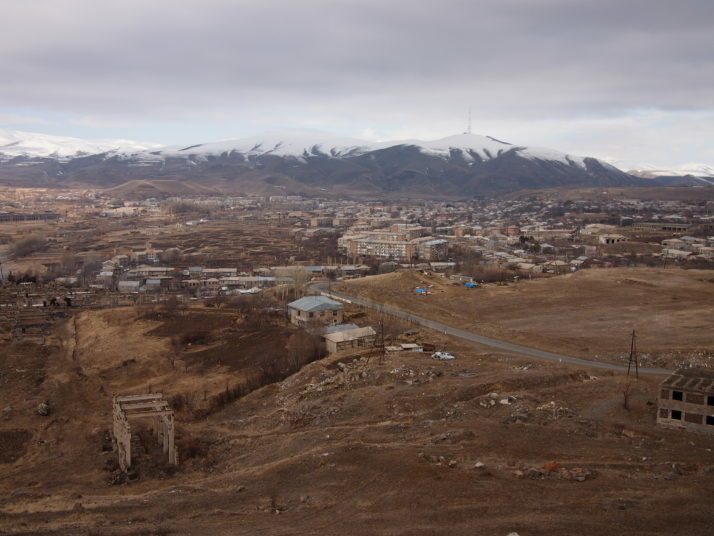 Next day our target was Goris, just 40km away, but we took advantage of the freedom we had driving ourselves to stop at a few places on the way. The tower tomb at Aghitu dates to the 7th century and has seemingly been plonked in the centre of an otherwise small and unremarkable village. We had a good look around and were heading back to the car when we noticed an elderly lady walking down the road giving us a pretty obvious side-eye once over. We responded to this in our usual way by smiling broadly and calling out ‘barev dzez!’ (Hello!) to which we received the very unusual response of said elderly lady stopping and engaging us in fluent (though clearly not recently practiced) and unaccented English, telling us she was a graduate of the Foreign Languages Institute. You could have knocked us over with a feather! Just a bit further down the road is the monastery of Vorotnavank. In a commanding position above the river Vorotan the monastery was largely destroyed in an earthquake in 1931 and has been rebuilt. We enjoyed looking at the carved stone fragments which litter the grounds. After a bit of an adventure trying (and failing) to go up a road which we eventually decided was far too rocky and rutted for our car, we arrived at our final stop, Kotrats Caravanserai. With nothing more than a signpost pointing away from the road to guide us we trotted off down a snowy track. Fortunately the ruined caravanserai was quite easy to spot. A modestly sized building, which could easily have been mistaken for a barn were it not for the inscription in Persian and Armenian over the main entrance, the caravanserai dates to 1319 and the vaulted chambers inside were used as a secure resting place by merchants travelling along the Silk Road. By the time we got back to the car we were hungry and as we drove the final 17km to Goris the weather turned into a steady downpour, making us very glad to arrive at our friendly B&B, home for the next few nights. This entry was posted in Experiences, Places and tagged Armenia, Cemetery, Monastery, Noratus, Sisian on April 21, 2017 by Julie. You were wise to hire the car. Love the photo of Andrew with it and also the photo of you both at Zorats Karer. What is 30 + 8 ?